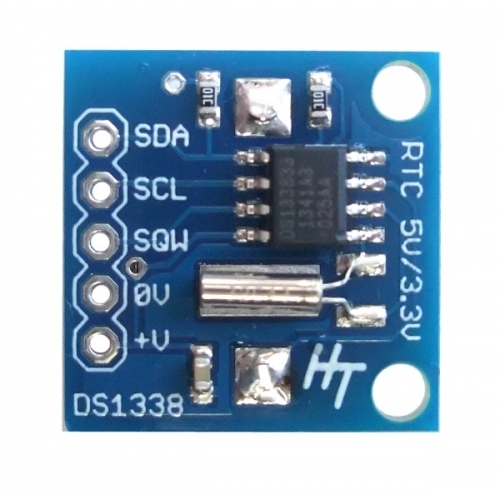 A Real Time Clock Module with battery backup using the easy to use DS1338 chip. The DS1338 is functionally the same as the popular DS1307 chip with the difference being that the DS1338 works at any voltage from 3V to 5V making it easy to use on either 3.3V and 5V systems without modification or logic level conversion. Ideal for your project including Arduino and Raspberry Pi projects. Makes you wonder why the DS1307 chip is still used? 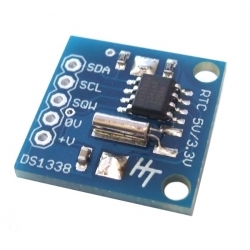 We have an example Arduino program for reading and writing the module, but any example code available for the DS1307 or DS1338 will work ok. The module comes fully assembled and pre-programmed with the *approximate* current time (UK Date/Time). 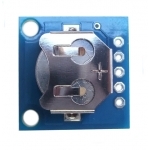 The included Lithium coin cell battery (CR1225) will typically run the module for 10 years without external power. 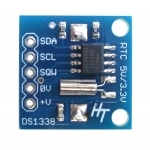 The DS1338 is accessed via the I2C protocol and we have added 10K pullup resistors to the SDA and SCL pins.